I finished the String melon top. I used Warm and Plush batting. 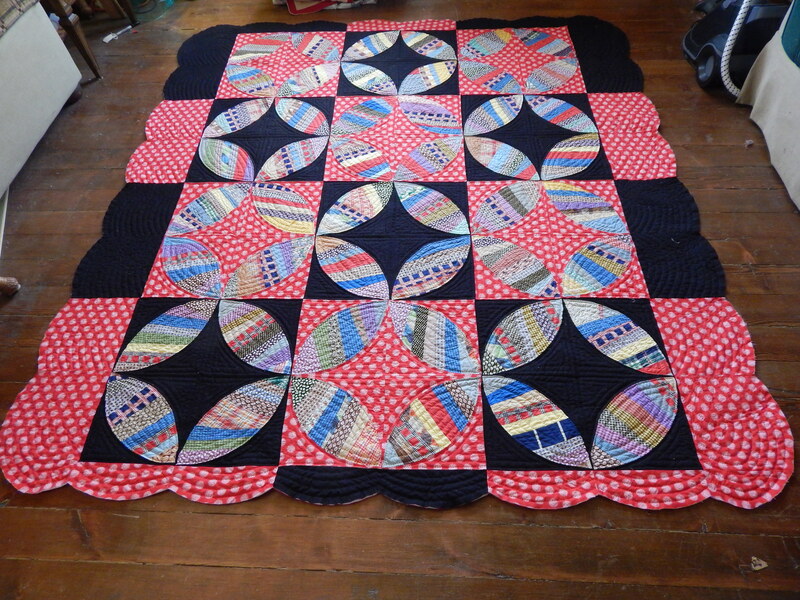 Here it is after the hand quilting was finished. Next is the binding. I used bias binding. 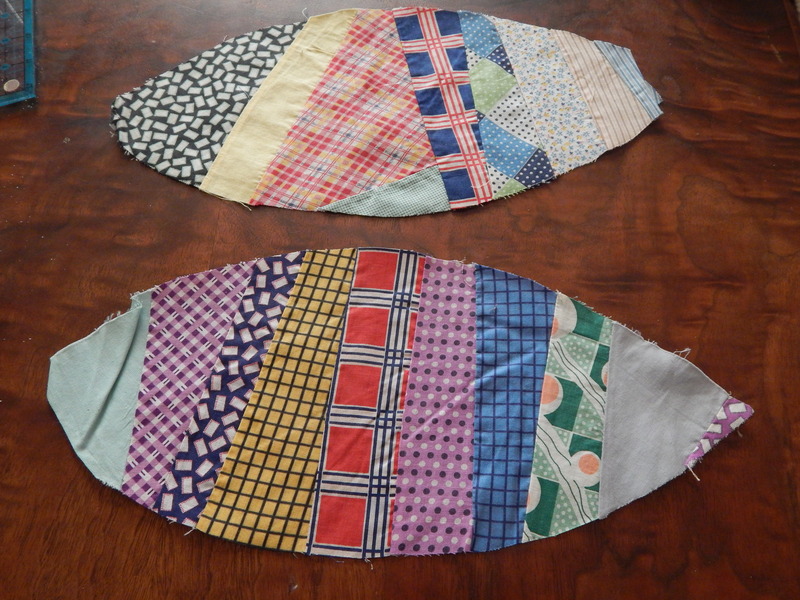 It was cut at only 1 1/2 inches wide , then folded in half so it was 3/4 inch then machine stitched to the top, folded to the back and hand stitched. It makes for a very narrow binding. 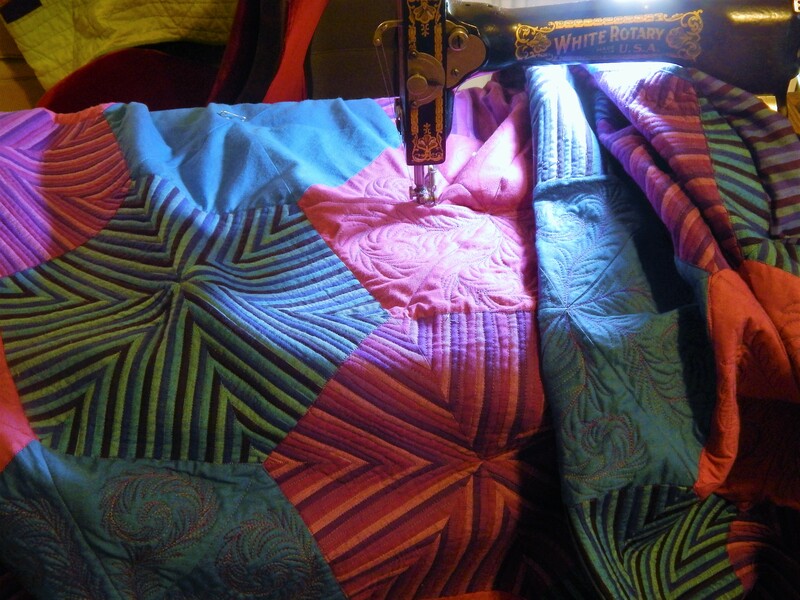 I always wash and dry a quilt when I finish it. 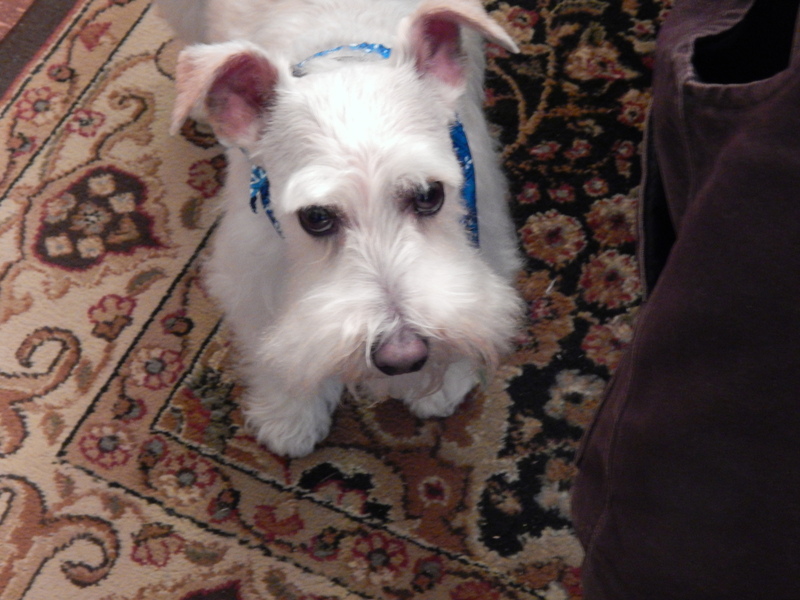 so into the washer …..Teddy is waiting for it to be finished. I do think I will use the batting again. It rained most of the day today but here are some garden pics from yesterday. 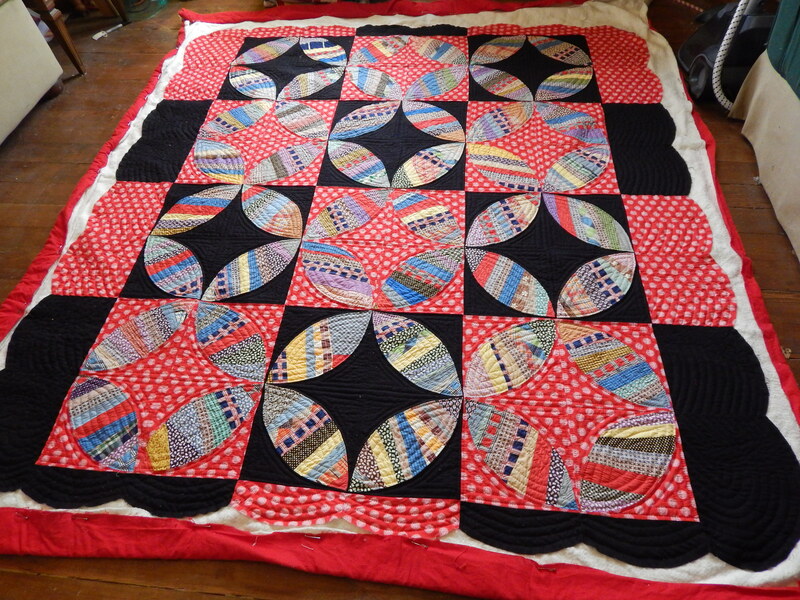 This entry was posted in Garden, Quilts and tagged hand quiltig, Quilts, vintage quilt top. Great finish! Really nice, chock that one off your list and on to the next! Tim, have you seen the 2015 poster for the Sisters Quilt Show……..
Beautiful! 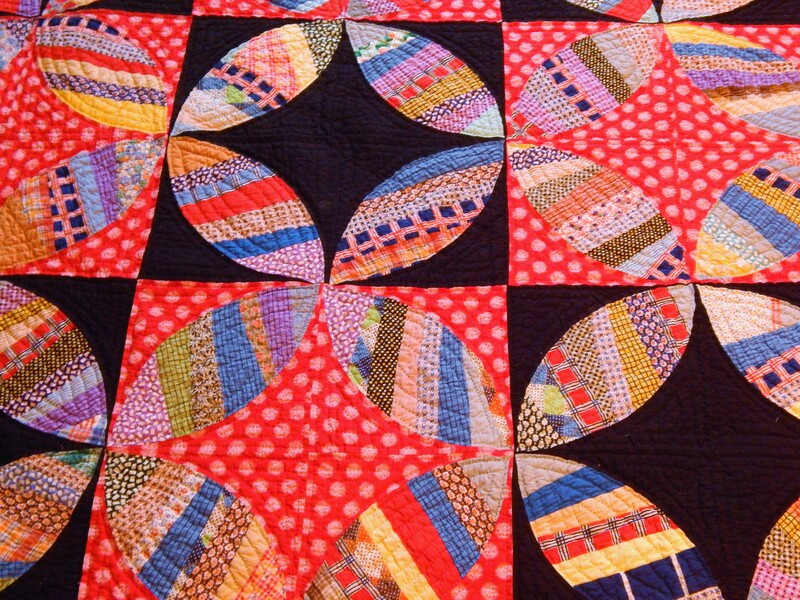 It would be great if the original maker of those melons could see your finished quilt. I think she or he would be very happy. That makes me happy ! I suspect you already had a sneaking suspicion, am I right? 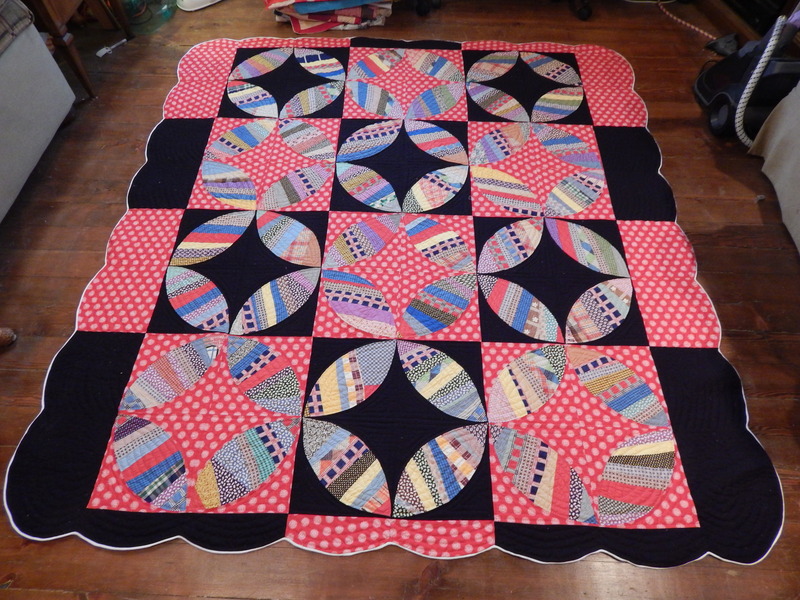 Those little strip pieced scrappy melons looked so SAD alone and now they have made a STUNNING quilt. Congratulations Tim on a creative well done finish. Love the look of the thick batting. Really nice! Beautiful! So unusual! Love to watch your progress. I wasn’t so keen on this at the start,you have transformed it into a MASTERPIECE!The binding is inspired! 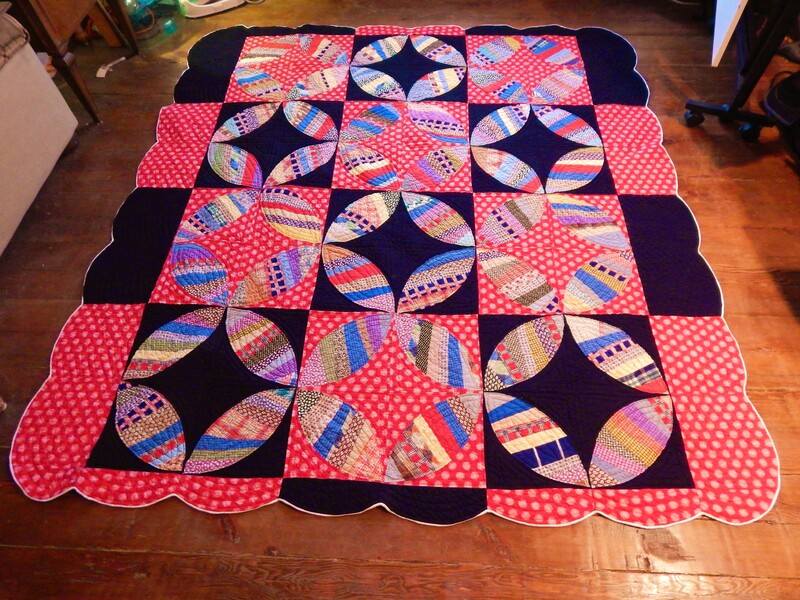 Congratulations on finishing this striking quilt! 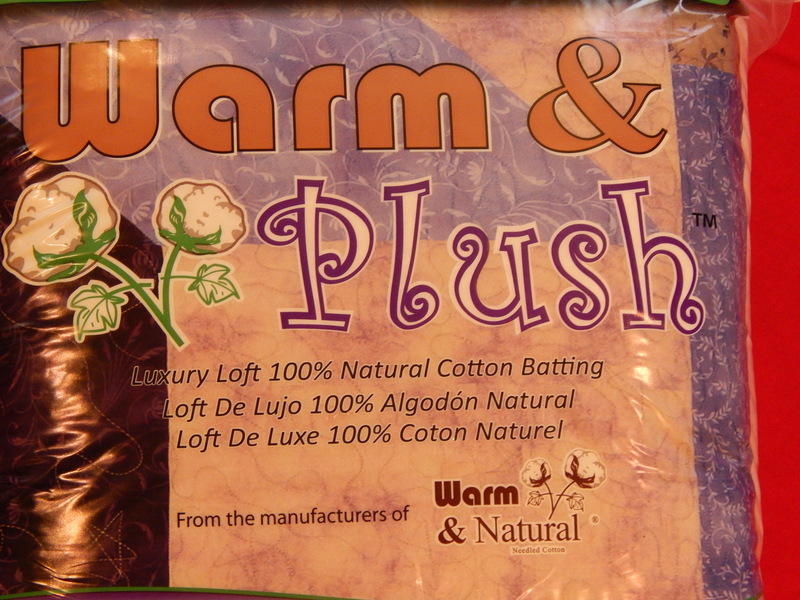 Is the Warm and Plush 100% cotton? I haven’t heard of this batt before so am thinking that it must be fairly new. Thanks for sharing all your garden and Teddy pics. 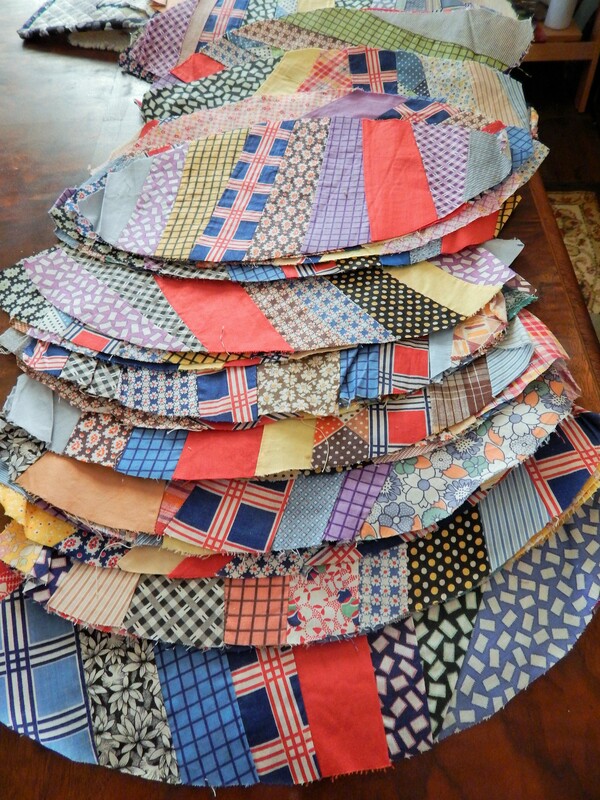 Looks great Tim, I am like you, I love salvaging those old quilt blocks from ebay. I may have bid against you on some of them. 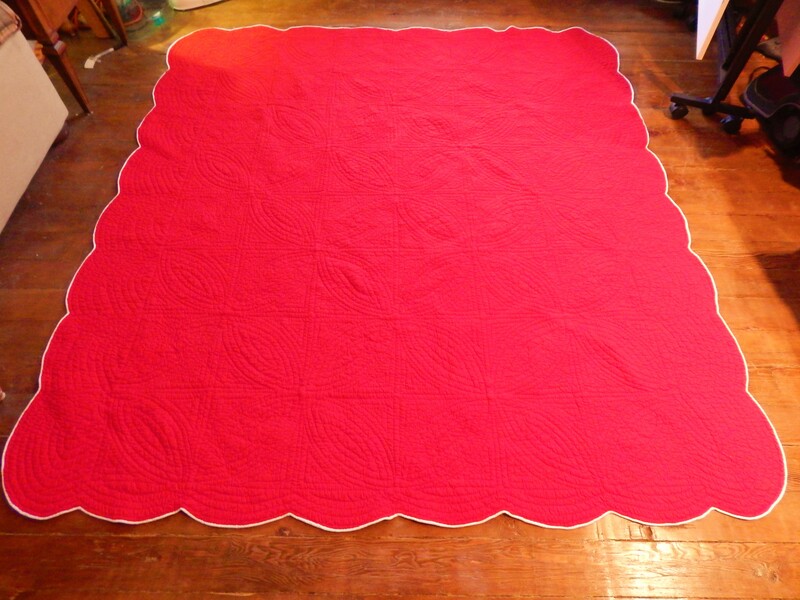 What beautiful definition from quilting the warm and plush batting plus the wash and dry treatment. 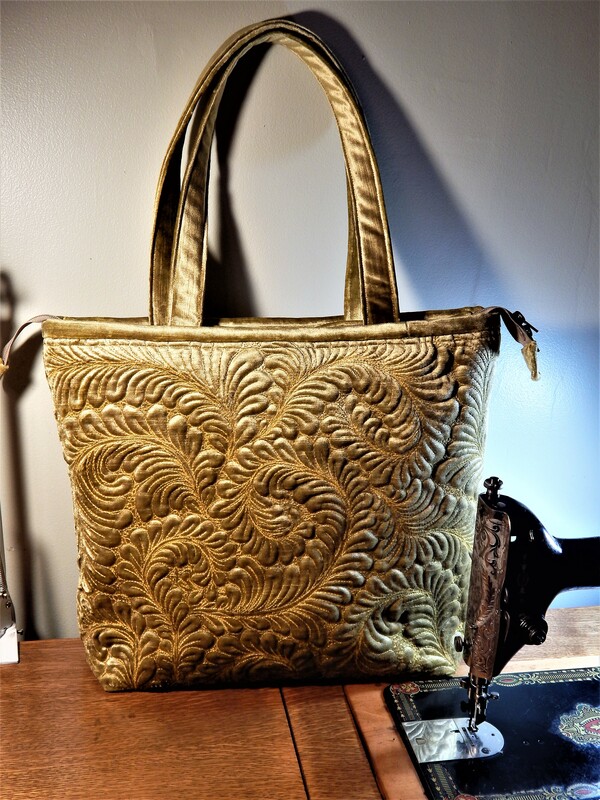 The narrow binding is a great finish on this piece. I learn so much from seeing your combinations. Thank you. If you ever get tired of looking at the front just turn it over. Both sides look great and that backing colour. is brilliant. 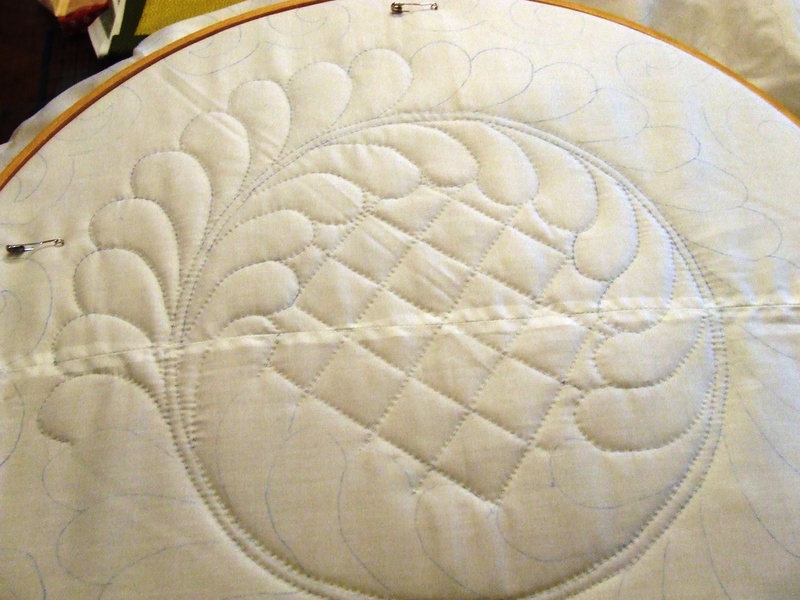 I do love the extra definition that batting has given to the quilting. Agree bidding is half the fun, I had to sit on my hands and let one beauty just slide by me this week, it hurt. The garden is picking up now. When I first looked at your pictures, the melons looked pretty inaccurate to me, did you have to recut them or was a good pressing enough. It is just perfectly gorgeous! Tim, absolutely Beautiful!!! 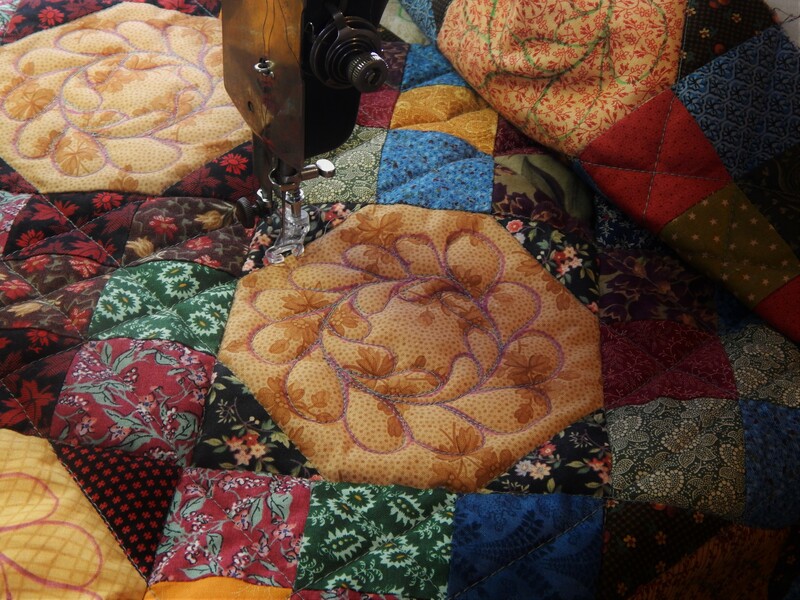 How many hours a day did you put in to quilt this beauty? Jeezee, not another one done! It’s beautiful, as usual. Nice job, you two! Tim that is stunning!!! Love your creativity!!! Once again, you have worked your magic for an awesome quilt! 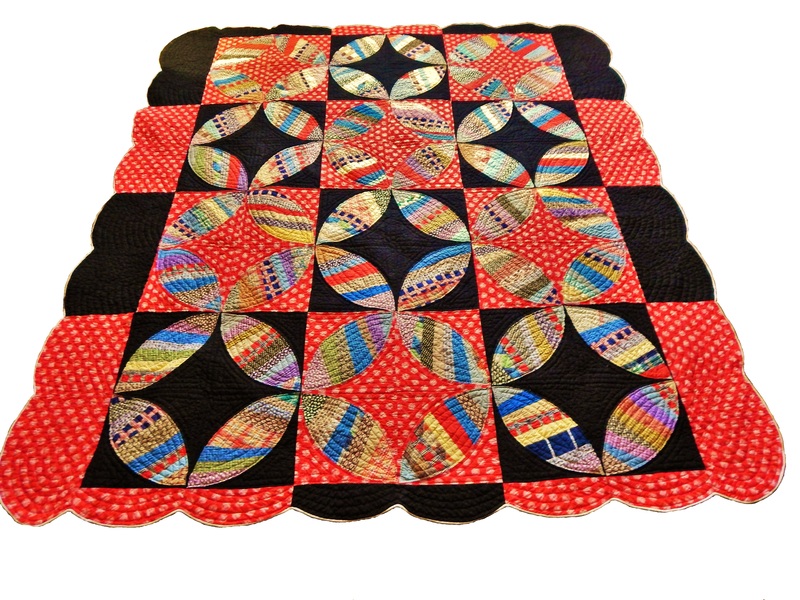 I love everything about it….I almost always use a thinner batting, but I have to admit, I really love the look of the dimension you got using a thicker batting on this quilt….thanks for introducing us to another option! Now you have to decide what project comes next….I don’t know how you decide, when you have such an extensive inventory to pick from! that is always the problem….deciding what is next…. Stunning finish! I really enjoyed that you also put measurements before and after washing in the post. Wouldn’t have thought it would shrink that much. And the garden is looking as good as the quilts! Will you plant any vegetables in the mix? Excellent Work, Tim! 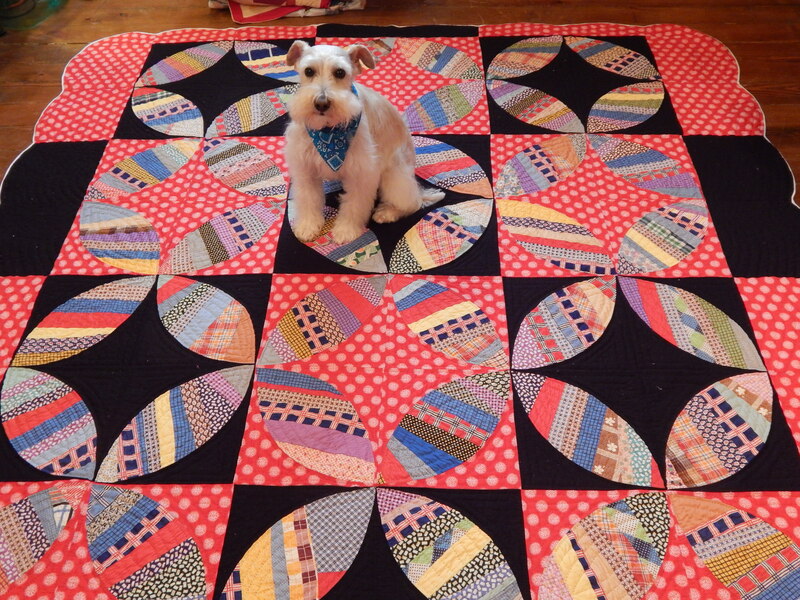 I appreciate how you post the process of your quilting and the materials used when quilting! I am learning a lot from you! You do great Work~! P.S. I recommend the Sisters Quilt Show! Very stunning displays of work!